1. Geology involves integration of various different sciences (chemistry, physics, and biology for example), but also requires an understanding of the importance of billions of years of geological time. 2. Paleontology is an important aspect of geology and requires an understanding of biology, including evolution, the physiology of animals and plants and ecological relationships. 3. Geologists provide information to reduce the risk of harm from hazards such as earthquakes, volcanoes, and slope failures; they play a critical role in the discovery of important resources; they contribute to our understanding of life and its evolution through paleontological studies; and they play a leading role in the investigation of climate change, past and present and its implications. 4. Halite is composed of sodium (Na) and chlorine (Cl) with the Na+ and Cl- ions alternating with one another in all three directions within a cubic structure. 5. A mineral has a specific chemical composition and lattice structure. Rocks are made out of minerals, and most rocks contain several different types of minerals. 6. The main component of Earth’s core is iron (Fe). 7. Transfer of heat from the core to the mantle leads to heating of lower mantle rock. When heated, the rock expands and its density is reduced. Because the mantle is plastic, this lower-density material tends to rise toward the surface, and cooler denser mantle material moves in to take its place. 8. Mantle convection creates the traction that can force plates to move around on the surface. 9. Hot mantle rock moving toward the surface partially melts because the pressure is reduced. The magma produced moves upward into cracks in the crust and is extruded onto the sea floor. 10. 215 – 65 = 150 Ma. Since the age of the Earth is 4570 Ma, this represents 150/4,570 = 0.033 or 3.3% of geological time. 11. At 1 mm/y 30,000,000 mm would accumulate over that 30 million years. This is equivalent to 30,000 m or 30 km. Few sequences of sedimentary rock are even close to that thickness because most sediments accumulate at much lower rates, more like 0.1 mm/y. 1. Charges: proton: +1, neutron: 0, electron: -1, Masses: proton: 1, neutron: 1, electron: almost 0. 2. The element’s atomic number will determine the extent to which its outer layers are populated with electrons. If the outer shell is not quite full, the atom may gain electrons to fill them and become an anion (negative charge). If the outer shell has only a few electrons, it may lose them and become a cation (positive charge). Cations and anions attract each other to form molecules with ionic bonding. 3. Helium and neon (and the other noble gases) have complete outer shells and therefore no tendency to form ionic bonds. 4. Electrons are transferred from one atom to another to form an ionic bond. Electrons are shared between atoms to form a covalent bond. 5. An anion has a negative charge and a cation has a positive charge. 6. Minerals are classified into groups based on their anion or anion group. 9. Magnesium can substitute freely for iron in olivine and several other minerals because they have similar charges (+2) and similar ionic radii. 10. Pyroxene is made up of single chains of tetrahedra while amphibole is made up of double chains. 11. Biotite includes iron and/or magnesium in its formula, while muscovite does not. 13. In quartz each silica tetrahedron is bonded to four other tetrahedra, and since oxygens are shared at each bond the overall ratio is silicon (+4) to two oxygens (2 x -2 = -4), which is balanced. 14. Some minerals have distinctive colours, but many have a wide range of colours due to differing impurities. 15. Glass has a Mohs hardness of about 5.5 while porcelain is close to 6.5. The mineral is between these two, so it must be close to 6. 1. The rock must be exposed at surface so in many cases uplift and removal of overlying sediments is required. Then chemical and/or physical weathering can take place, which reduces the rock to smaller loose fragments. These fragments are sediments that can be eroded and then transported by a variety of maechanisms. 2. Sediments are buried beneath other sediments where, because of the increased pressure, they become compacted and dewatered. With additional burial they are warmed to the point where cementing minerals can form between the grains (less than 200˚C). 3. Rock is buried within the crust and heated because of the geothermal gradient. At temperatures over 200˚C some of the existing minerals may become unstable and will be converted to new minerals, or recrystallized into larger crystals. 4. As the temperature decreases minerals that formed early (e.g., olivine) may react with the remaining magma to form new minerals (e.g., pyroxene). 5. Calcium-rich plagioclase forms early on in the cooling process of a magma, but as the temperature drops, a more sodium-rich variety forms around the existing crystals. 6. Early-forming minerals, which are typically quite dense (e.g., olivine) may sink to the bottom of the magma chamber (if the magma is not too viscous) and thus become separated from the rest of the magma, resulting in a change to the composition of the remaining magma (it becomes more felsic). 7. If the texture is aphanitic the crystals are too small to see without a microscope. In rocks with phaneritic textures the minerals are large enough to see and distinguish from each other with the naked eye. The dividing line is somewhere between 0.1 and 1 mm, depending on the minerals. 8. In porphyritic rocks there are two distinct crystal sizes that are indicative of two stages of cooling (slow then fast). The fine material can range from glass to several mm, as long as the coarse crystals are distinctively larger. In pegmatitic rocks the crystals are consistently coarser than 1 cm, and can be much larger. Pegmatites form the slow cooling of water-rich magmas. 10. A concordant body (a sill) is parallel to any pre-existing layering (bedding or foliation) in the country rock is. A discordant body (a dyke) cuts across any pre-existing layering or is situated at any angle in country rock that has no layering (e.g., granite). 11. A rock has to crack in order for a dyke to intrude into it, and it has to be cool to crack. When the hot magma intrudes into the cold country rock its margins cool quickly (forming small crystals), while its centre cools more slowly (forming larger crystals). 12. A batholith has an exposed area of greater than 100 km2; a stock has an exposed area less than that. 13. Batholiths (or stocks) intrude into existing rock by (a) melting through the country rock, or (b) causing the country rock to break and fall into the magma (stoping), or (c) pushing the country rock aside. 14. Compositional layering forms when early-crystallizing mineral sink toward the bottom of a magma chamber. This can only happen in non-viscous magma, and mafic magma is typically much less viscous than felsic magma. 1. The three main tectonic settings for volcanism are (1) subduction zones at convergent plate boundaries, (2) divergent plate boundaries, and (3) mantle plumes (a.k.a. hot spots). 2. The primary mechanism for partial melting at a convergent plate boundary is the addition of water to hot mantle rock. The water reduces the melting temperature of the rock (flux melting). 3. The explosiveness of a volcanic eruption depends on the pressure of the magma. Gases create that pressure, and if the magma is viscous those gases cannot escape easily. Felsic and intermediate magmas tend to have more gas than mafic magmas, and are also more viscous, trapping the gas in. 4. When magma is deep within the crust the pressure is too high for the gases to bubble out of solution. 5. Pillow lavas form where mafic lava erupts in water. When the magma oozes out into the water the outside cools first forming a hard skin that maintains the pillow shape. 6. Composite volcanoes can produce rocks with a wide range of textures, including (1) aphanitic or porphyritic rock from lava flows, (2) pyroclastic rock (with textures ranging from fine ash to coarse fragments) from explosive eruptions, and (3) sedimentary rock from lahars. 7. A lahar is a mud flow or debris flow on a volcano. Lahars are common on composite volcanoes because they are steeper than shield volcanoes, they typically have ice and snow, and they are not as strong as shield volcanoes. 8. Some lahars form during an eruption when snow and ice melt quickly, while others may form from heavy rain. 9. The magma at shield volcanoes is typically non-viscous. It can flow easily and also tends to form lava tubes, and thus is able to extend a long way from the vent, forming a low broad shield. 10. Shield volcanoes tend to have much longer lives than composite volcanoes. Most of the Hawaiian shields, for example lasted 1 million years, while most composite volcanoes are younger than 100,000 years. 11. Weak seismic activity is associated with all stages of a volcanic eruption. In the early stages magma is moving at depth and pushing rock aside, creating small earthquakes. The flow of magma can also produce special type of seismic response known as harmonic tremor. 12. GPS technology is used to determine if there is any slow deformation of the flanks of a volcano related to movement of magma toward the surface. 13. The Mt. St. Helens columnar basalts were formed by a flow of mafic lava. 14. The Nazko Cone is thought to be related to a mantle plume. 15. No one is certain why there a lower rate of volcanism in B.C. 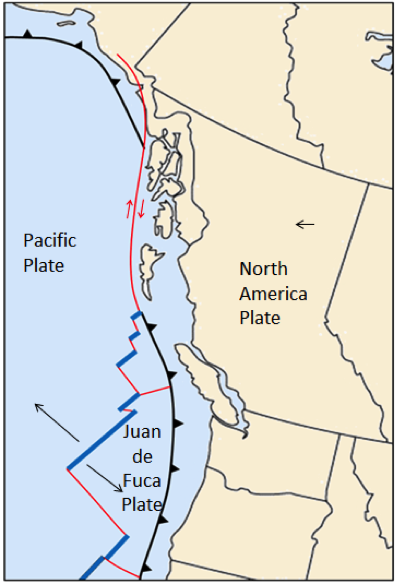 than in adjacent Washington and Oregon, but one theory is that the northern part of the Juan de Fuca Plate (the Explorer Plate) is not subducting as quickly as the rest of the plate. 16. It is likely that carbon dioxide released during the eruption flowed downhill from the volcano to the village on the shore of the Nass River. 1. Before a rock can be exposed at surface it has to be uplifted from where it formed deep in the crust, and the material on top has to be eroded. 2. Frost wedging is most effective at times when the weather swings between freezing at night and thawing during the day. In cold parts of B.C. that only happens consistently in spring and fall. In warmer regions it only happens consistently during the winter. 3. Under conditions of strong chemical weathering, feldspar albite (NaAlSi3O8) will be converted to a clay (such as kaolinite) and sodium ions in solution. Where mechanical weathering is predominant, albite will be broken into small pieces. 4. Acid rock drainage (ARD) creates acidic stream runoff and also enhances the solubility of a wide range of metals, some of which can be toxic. 5. Feldspar-rich sand is formed in areas where granitic rocks are being weathered and where mechanical weathering is strongly predominant over chemical weathering. 6. Most of the clay that forms during hydrolysis of silicate minerals ends up in rivers and is washed out to the oceans. There it eventually settles to the sea floor. 7. The mineral composition of the parent rock or sediment will influence the composition of the resulting soil. Slope is important because it will affect the degree to which materials will be eroded. 8. Clay minerals and iron move downward to produce the B horizon of a soil. 9. Removal of vegetation leaves soil exposed to erosion by water, and wind are the main processes of soil erosion in Canada. 10. Chernozemic soils are common in the southern prairies and parts of the BC southern interior, in areas that experience water deficits during the summer. 11. Luvisolic soils are found in central B.C., mostly over sedimentary rocks. 12. The weathering feldspar to clay involves the conversion of atmospheric carbon dioxide to dissolved bicarbonate, which ends up in the ocean. 1. Sand grains range in size from 1/16 mm to 2 mm. 2. Both silt and clay feel smooth between your fingers, but only clay feels smooth in your mouth. 3. The key factor is particle size (not density). Settling velocity is controlled by the friction around the grain holding it up and the gravitational force pushing it down. The gravitational force is proportional to the grain volume and the friction is proportional to the surface area. 4. Conglomerate cannot be deposited by a slow-flowing river because clasts larger than 2 mm are not transported by slow-moving water. 5. Sediments are buried beneath other sediments where, because of the increased pressure, they become compacted and dewatered. With additional burial they are warmed to the point where cementing minerals can form between the grains (less than 200˚C). 6. Lithic arenite has less than 15% silt- and clay-sized particles, while a lithic wacke has more than 15%. Both have more than 10% rock fragments and more rock fragments than feldspar. 7. Feldspathic arenite has more than 10% feldspar and more feldspar than rock fragments. Quartz arenite has less than 10% feldspar and less than 10% rock fragments. Both have less than 15% silt and clay. 8. Source area lithology: rock that contains quartz (such as granite or sandstone), strong weathering to remove feldspar, long fluvial transportation to round the grains. 9. The carbon within carbonate deposits such as limestone originally comes from the atmosphere. 10. Most of Earth’s banded iron formations formed during the initial oxygenation of the atmosphere between 2.4 and 1.8 Ga because iron that had been soluble in the anoxic oceans became insoluble in the oxidized oceans. 11. Terrestrial depositional environments: rivers, lakes, deltas, deserts, glaciers. Marine depositional environments: continental shelves, continental slopes, deep ocean. 12. A foreland basin forms in the vicinity of a large range of mountains where the weight of the mountains depresses the crust on either side. A forearc basin lies between a subduction zone and the related volcanic arc. 13. (a) Bedding forms where there is an interruption or change in the depositional process, or a change in the composition of the material being deposited. (b) Cross-bedding forms in fluvial or aeolian environments where sand-sized sediments are being moved and ripples or dunes are present. (c) Graded bedding, and (d) mud cracks form where fine-grained (silt or clay) sediments are allowed to dry because the level of a lake decreases. 14. Reverse graded bedding forms during gravity flows, such as debris flows. 15. A formation is a series of beds that is distinct from other beds above and below it, and is thick enough to be shown on the geological maps that are widely used within the area in question. 16. The Nanaimo Group was actively mined for coal for many decades. During that time the names were given to members and individual beds that were important to the coal miners. 1. Heat and pressure are the main agents of metamorphism. Heat leads to mineralogical changes in the rock. Pressure also influences those mineralogical changes, while directed pressure (greater pressure in one direction) leads to foliation. 2. At very low, low, medium, and high metamorphic grades, mudrock will be transformed into slate, phyllite, schist, and gneiss. 3. Granite remains largely unchanged at lower metamorphic grades because its minerals are still stable at those lower temperatures. 4. Foliation exists because as new minerals are forming in a situation of directed pressure they are forced to grow with their long axes perpendicular to the main pressure direction. 5. At a spreading ridge the heat from volcanism leads to the development of a groundwater convection system in the oceanic crustal rock. Heated water rises in the hot regions and is expelled into the ocean, while cold ocean water is drawn into the crust to replace it. The heated water leads to the conversion of ferromagnesian minerals (e.g., olivine and pyroxene) into chlorite and serpentine. 6. The geothermal gradient varies as a function of tectonic setting, being greatest in volcanic regions and lowest along subduction zones. As a result the depth at which specific metamorphic grades is achieved will vary (greater depth where the gradient is least). 7. The geothermal gradient is low within subduction zones (because the cold subducting oceanic crust takes a long time to heat up), so while pressure increases at the normal rate the temperature does not. 8. In order of increasing metamorphic grade: chlorite biotite, garnet, sillimanite. 9. The rocks at significant depth in the crust are already hot and subject to regional metamorphism, so the additional heat from a pluton doesn’t make a large difference. 10. Water from any source facilitates metamorphism. Magmatic fluids typically contain dissolved ions at higher levels than in regular groundwater (especially copper, zinc, silver, gold, lithium, beryllium, boron and fluorine) so can lead to formation of a unique set of minerals. 11. Metasomatism involves fluids from magmatic or groundwater sources that play an important role in transporting ions and leading to the formation of new minerals. 12. A hot pluton heats the surrounding water and this contributes to the development of a convection system in the groundwater, which can result a great deal of water, in some cases with elevated levels of specific ions, passing through the rock. Magmatic water also contributes to metasomatism. 13. Limestone must be present in the country rock to produce a skarn. 14. Two things that a geologist first considers when looking at a metamorphic rock are what the parent rock might have been, and what type of metamorphism has taken place. Chlorite schist A rock enriched in ferromagnesian minerals, such as basalt. Low-grade regional metamorphism. Amphibolite A rock enriched in ferromagnesian minerals, such as basalt. 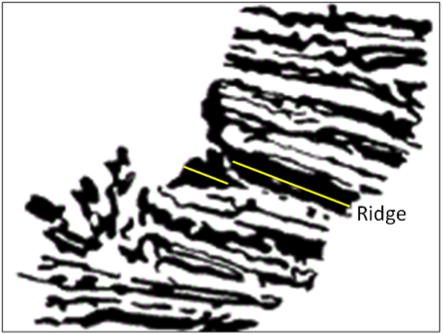 Medium- to high-grade regional metamorphism. Marble Limestone or dolomite Regional or contact metamorphism. 1. Xenoliths of basalt within a granite must be older than the granite according to the principle of inclusions. 2. (a) At both disconformities and paraconformities the beds above and below are parallel, but at a disconformity there is clear evidence of an erosion surface (the lower layers have been eroded). (b) A nonconformity is a boundary between sedimentary rocks above and non-sedimentary rocks below while an angular unconformity is a boundary between sedimentary rocks above and tilted and eroded and sedimentary layers below. 3. A useful index fossil must have survived for a relatively short period (e.g., around a million years), and also should have a wide distribution so that it can be used to correlate rocks from different regions. 4. The granitic rock “f” has been dated to 175 Ma. The wood in layer “d” is approximately 5,000 years old, so we can assume that layer “d” is no older than that, although it could be as much as a few hundred years younger if the wood was already old when it got incorporated into the rock. 5. Layer “c” must be between 5,000 y and 275 Ma. 6. The unconformity between layer “c” and rock “f” is a nonconformity. 7. The granite (f) was eroded prior to deposition of “c”, so it’s likely that layer “b” was also eroded at the same time. If so, that makes the boundary between “c” and “b” a disconformity. 8. The last magnetic reversal was 780,000 years ago, so all rock formed since that time is normally magnetized and it isn’t possible to distinguish older rock from younger rock within that time period using magnetic data. 9. William Smith was familiar with the different diagnostic fossils of the rocks of England and Wales and was able to use them to identify rocks of different ages. 10. The last age of the Cretaceous is the Maastrichtian (70.6 to 65.5 Ma) and the first age of the Paleogene is the Danian (65.5 to 61.7 Ma). 1. Typical stony meteorites are similar in composition to the Earth’s mantle, while typical iron meteorites are similar to the core. 3. P-waves can pass through a liquid and travel approximately twice as fast as S-waves (which cannot pass through a liquid). 4. 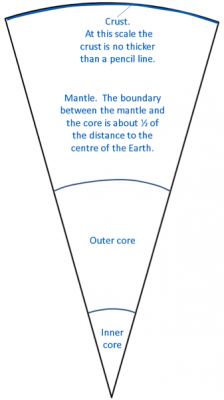 P-wave velocity decreases at the core-mantle boundary because the outer core is liquid. 5. The mantle gets increasingly dense and strong with depth because of the increasing pressure. This difference affects both P-wave and S-wave velocities, and they are refracted toward the lower density mantle material (meaning they are bent out toward Earth’s surface). 6. 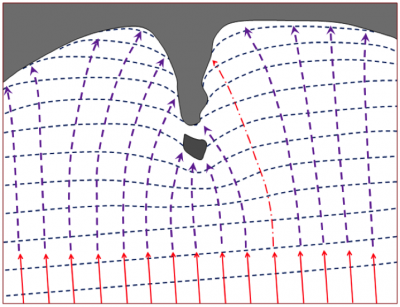 The key evidence for mantle convection is that the rate of temperature increase within the mantle is less than expected and this can only be explained by a mantle that is mixing by convection. The mechanism for convection is the transfer of heat from the core to the mantle. 7. Earth’s magnetic field is generated within the liquid outer part of the core by the motion of the metallic core material. 8. The last two reversals of Earth’s magnetic field were at the beginning of the present Brunhes normal chron (0.78 Ma), and at the end of the Jaramillo normal subchron (0.90 Ma). 9. The isostatic relationship between the crust and the mantle is dependent on the plastic nature of the mantle. 10. In the area of the Rocky Mountains the crust is thickened and pushed down into the mantle. In Saskatchewan the crust is thinner and does not extend as far into the mantle. 11. During the Pleistocene glaciation British Columbia was pushed down by glacial ice and mantle rock flowed slowly out beneath the ocean floor. Now that the land area is rebounding, that mantle rock is flowing back and the offshore areas are subsiding. 1. The evidence used by Wegener to support his idea of moving continents included matching continental shapes and geological features on either side of the Atlantic; common terrestrial fossils in South America, Africa, Australia, and India; and data on the rate of separation between Greenland and Europe. 2. The primary technical weakness of Wegener’s theory was that he had no realistic mechanism for making continents move. 3. (a0 Contractionists assumed that mountains formed because as the Earth contracted the crust wrinkled into mountains. (b) Permanentists assumed that mountains formed by the geosynclinal process. 4. In the late 19th century the trans-Atlantic paleontological matchups were explained by assuming that there must have been land bridges between the continents at some time in the past, or that terrestrial organisms had floated across the ocean on logs. 5. Continental crust is lighter than oceanic crust and cannot sink low enough into the mantle to become an ocean (although this can happen over limited areas, and commonly does happen along coastal areas of continental plates). 6. Prior to 1920, ocean depths were measured by dropping a weighted line over the side of ship. Echo sounding techniques were developed at around that time and that greatly facilitated the measurement of ocean depths. 7. Temperature increases quite rapidly with depth in the crust, but much less so in the mantle, and this implies mantle convection. 8. Paleomagnetic studies showed that old rocks on the continents had different pole positions than they do today, and also that they were progressively more different with time past. This implied either that the poles had moved or that the continents had moved. It was also found that the apparent polar wandering paths for different continents were different, and this supported the concept that the continents had moved. 9. The trenches associated with subductions zones are the deepest parts of the oceans. 10. The ocean ridge areas are the youngest parts of the sea floor and thus there hasn’t been time for much sediment to accumulate. 11. It was (and still is) assumed that high heat flow exists where mantle convection cells are moving hot rock from the lower mantle toward the surface, and that low heat flow exists where there is downward movement of mantle rock. 12. Earthquakes are consistently shallow and relatively small at ocean ridges. At ocean trenches earthquakes get increasingly deep in the direction that the subducting plate is moving. The earthquakes near to surface can be very large, while those at depth tend to be small. 13. In the Hess model new crust was formed at ocean ridges and then was consumed back into the mantle at the trenches. 14. Hess’s theory did not include the concept of tectonic plates. 15. The spreading ridge is shown as a yellow line. 16. A mantle plume is a column of hot rock (not magma) that ascends toward the surface from the lower mantle. It is hypothesized that mantle plumes ascend as much as 10 times faster than the rate of mantle convection. 17. 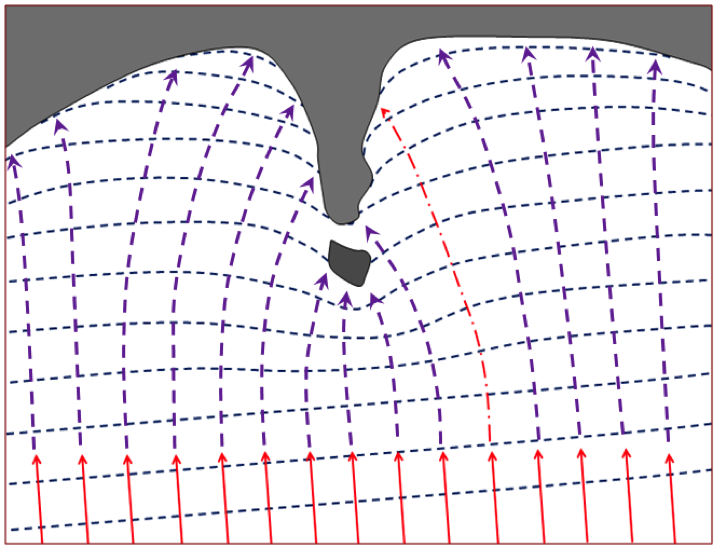 (a) Between the ridge segments there is movement in opposite directions along a transform fault. (b) Outside of the ridge segments the two plates are moving in the same direction and likely at about the same rate. In this case there is no faulting, and it is known as a fracture zone. 18. Tectonic plates are made up of crust and the lithospheric (rigid) part of the underlying mantle. 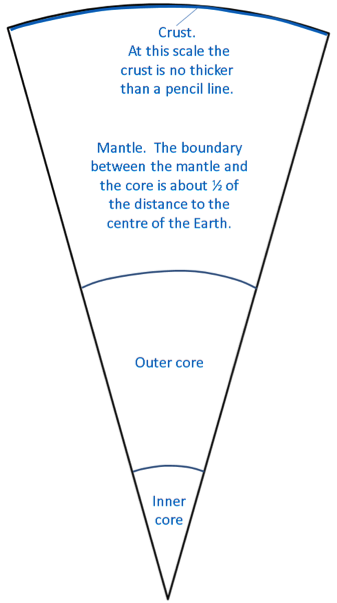 The mantle part ensures that the very different oceanic and continental crust sections of a plate can act as one unit. 19. A mantle plume beneath a continent can cause the crust to form a dome which might eventually split open. Several mantle plumes along a line within a continent could lead to rifting. 20. Subduction does not take place at a continent-continent convergent zone because neither plate is dense enough to sink into the mantle. 21. The divergent boundaries are blue, the convergent boundaries are black with teeth on them, and the transform boundaries are red. 22. The motion directions are shown with black arrows (see map for names of plates). 23. The sense of motion on the Queen Charlotte Fault is shown with red arrows. 24.Continental rifting is taking place along the East Africa Rift, and sea floor has recently been created in the Red Sea and also in the Gulf of California. 25. Over the next 50 million years California is likely to split away from the rest of North America along the San Andreas Fault and then move north toward Alaska. 26. The accumulation of sediment at a passive ocean-continent boundary will lead to the depression of the lithosphere and could eventually result in the separation of the oceanic and continental parts of the plate and the beginning of subduction. 1. An earthquake is the shaking caused by the release of energy that takes place when rocks under stress within Earth break and then the two sides slide past each other. 2. Rocks under stress will deform elastically until they reach the point where the stored elastic energy exceeds the rock strength. At that point the rock breaks and an earthquake is produced. 3. The rupture surface is the surface over which there is displacement of rock during an earthquake. The magnitude of an earthquake is proportional to the area of the rupture surface and the average amount of displacement over that surface. 4. An aftershock is any earthquake that is considered to have been caused by a previous earthquake as a result of the transfer of stress from the original earthquake. 5. 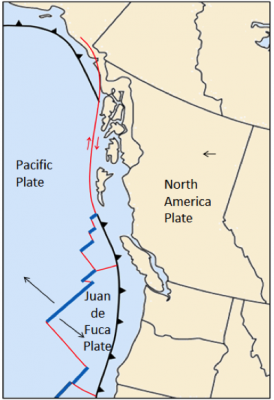 Episodic slip on the middle part of the Cascadia subduction zone decreases stress within that area, but some of that stress is transferred to the locked zone up dip along the plate boundary, there increasing the level of stress on the locked part. 6. Magnitude is the amount of energy released by an earthquake. Each earthquake has only one magnitude, although there are different ways of measuring it, and they may give slightly different results. Intensity is a measure of the amount of damage done or what people felt. Intensity varies depending on the distance to the epicentre and the type of rock or sediment underlying an area. 7. An M7.3 earthquake releases 1,024 times as much energy as an M5.3 earthquake. 8. The map shows a subduction boundary. The depth of earthquakes increases inshore (to the east) from the location of the subduction zone. 9. 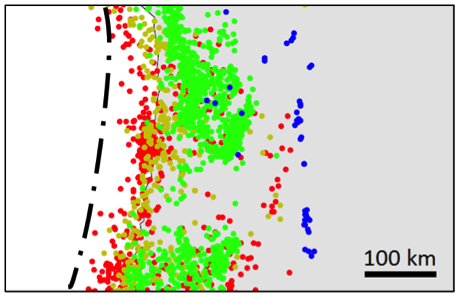 The dash-dot line shows approximately where the plate boundary is situated. 10. The plate on the left (Nazca Plate) is moving east and the one on the right (South America Plate) is moving west. This is the eastern coast of South America around Peru and Chile. 11. Both divergent and transform boundaries are associated with mid-ocean ridges. Most earthquakes take place on the transform boundaries. 12. The northward motion of the Pacific Plate relative to the North America Plate takes place along the San Andreas Fault in California and along the Queen Charlotte Fault off the coast of British Columbia and southern Alaska. 13. Unconsolidated sediments, especially if they are saturated with water, can lose strength when subjected to earthquake shaking. This can cause buildings to subside or tilt. Unconsolidated sediments can also amplify the vibrations of an earthquake. 14. Gas lines and electrical transmission wires are typically damaged during an earthquake, and this can lead to serious fires. 15. A large subduction earthquake (greater than M7.5) can generate a tsunami because they typically result in vertical displacement of the sea floor. 16. The 2004 Parkfield earthquake showed that we cannot rely on foreshocks to predict earthquakes, or on any of the many other parameters that were being carefully measured around Parkfield in the years leading up to the quake. 17. We should know about the history of past large earthquakes, the typical locations of small earthquakes, the types of geological materials beneath the surface (especially soft water-saturated sediments), the types of infrastructure that is present, and the various ways that people can be evacuated from an area or assistance can be brought in. 18. Forecasting involves estimating the risk of an earthquake happening in a region within a period of time (usually expressed in decades). Prediction involves stating that an earthquake is likely to happen at a certain location on a specific day or month or year in the future. With our current state of knowledge of earthquakes, prediction is not possible. 1. Convergent plate boundaries are the most likely to contribute to compression, divergent boundaries to extension, and transform boundaries to shearing, however all of these stress regimes can exist at any one of these boundaries. 2. When elastic strain takes place the rock can rebound to its original shape. When there is plastic strain the rock will be permanently deformed. 3. Stronger rocks are more likely than weaker ones to deform elastically. Rock that is hot is more likely to deform plastically. Clay-bearing rocks are more likely to deform plastically when they are wet. If stress is applied quickly, the rock is more likely to break than if it is applied slowly. 4. The axial planes are shown with dashed red lines. 5. Volcanic rocks cool quickly at surface and the resulting reduction in volume can easily lead to fracturing. 6. In a normal fault the rock above the fault moves down with respect to the lower rock. This normally indicates extension. In a reverse fault the rock above the fault is pushed up, which indicates compression. 7. Most faults near transform boundaries are strike-slip faults, meaning that there is horizontal motion along the fault. 8. (a) The beds are dipping at about 30˚ to the northwest. (b) If it is possible to show that the beds are not overturned then we can say that bed 4 is the oldest. (c) “a” is a dyke and it is dipping steeply to the northeast. (d) “b” is a fault and it is dipping steeply to the southeast. (e) The motion on fault “b” appears to be left lateral. There may also be some vertical motion on “b” (or in fact the motion may be entirely vertical), but we cannot determine that from the information provided. 1. Approximately 1% of the Earth’s water is liquid fresh water. 2. Approxmately 30% of the Earth’s fresh water is groundwater. 4. Many of the streams in the southwestern part of Vancouver Island flow to the ocean as waterfalls because the land has been uplifted relative to sea level over the past several thousand years. 5. The fastest water flow on a straight stretch of a stream will be in the middle of the stream near the surface. 6. 1 mm sand grains will be eroded if the velocity if over 20 cm/s and will be kept in suspension as long as the velocity is over 10 cm/s. 7. If the flow velocity is 1 cm/s particles less than 0.1 mm (fine sand or finer) can be transported, while those larger than 0.1 mm cannot. At this velocity no particles can be eroded. 8. A braided stream can develop where there is more sediment available than can be carried in the amount of water present at the rate at which that water is flowing. This may happen where the gradient drops suddenly, or where there is a dramatic increase in the amount of sediment available (e.g., following an explosive volcanic eruption). 9. If a meander is cut off it reduces the length of a stream so it increases the gradient. 10. The average gradient of the Fraser River between Hope and the Pacific Ocean is 0.28 m/km (or 28 cm/km). 11. In coastal regions of B.C. the highest levels of precipitation are in the winter, and large parts of most drainage basins are not frozen solid. As a result stream discharges tend to be greatest in the winter. 12. In most parts of Canada winter precipitation is locked up in snow until the melt season begins, and depending on the year and the location that happens in late spring or early summer. If the thaw is delayed because of a cold spring, and then happens very quickly, flooding is likely. Some regions also receive heavy rainfall during this period of the year. 13. Ri = (n+1)/r (where n is the length of the record) and r is the rank of the flood in question. In the Ashnola River case Ri = (65+1)/2 = 33. The probability of such a flood next year is 1/Ri, or 1/33 which is 0.03 or 3%. 1. Porosity is the proportion of open space (space that can be filled with water), within a rock or unconsolidated sediment. Permeability is an expression of the ease with which water will flow through that material. 2. Clay deposits have low permeability because of the small size of the clay fragments. Water is tightly held to the grains by surface tension, and in the very small spaces between grains in clay there is virtually no water that is not able to flow. 3. From least to most permeable: unfractured gneiss, mudstone, sandstone, fractured granite, limestone in a karst region. 4. (a) Sue’s well accesses an unconfined aquifer with low permeability. (b) Frank’s well accesses a confined aquifer with high permeability. (c) Sue’s low capacity aquifer acts as a (leaky) confining layer to Frank’s high capacity aquifer. 6. After a drop of 9 m (from 83 to 74 m), and assuming that the other well did not drop at all, the gradient direction will have changed and the groundwater should flow toward the well that now has a level of 74 m.
7. Governments have the responsibility to protect our resources and to do their best to make sure that individuals and industry can access the groundwater that they need. Without observation well networks governments will have no independent information on how water levels are changing, and will be unable to make decisions on what might need to be done to ensure an adequate water supply for all. 8. Natural groundwater contamination originates from the natural reactions between the groundwater and the aquifer minerals. Anthropogenic groundwater contamination typically comes from human-sourced chemicals at or near to surface that are allowed to leak into the aquifer. 9. Water travels faster through a highly permeable aquifer and thus can spread the contamination further than in a less permeable one. 10. Livestock wastes are rich in nitrogen compounds, and these most commonly lead to nitrate contamination within the groundwater. Livestock wastes may also contain pharmaceuticals, which could contaminate groundwater. 11. The mineral pyrite is most likely to be responsible for acid rock drainage. 12. The waste water in a septic field needs to percolate slowly through the ground in order for natural processes to break down the contaminants. If the permeability is too low the waste water could come to surface. If the permeability is too high it could contaminate groundwater. 2. Based on the relative lengths of the arrows it appears that this material is stable, and unlikely to fail. 3. If the shear strength was reduced by 25% (right-hand diagram) the material would be much closer to failure, but the strength (based on the length of the arrows) still appears to be greater than the shear force. 5. In moist sand the grains are each surrounded by an envelope of water, and the water envelopes overlap. The attractive surface tension of the water holds the grains together. 6. In a the material moves like a fluid (individual particles move independently). In a the mass moves as an intact unit, with little or no relative motion between grains or clasts. 7. If a large rock slide starts moving at a rate of several metres per second, the rock is very likely to break into smaller pieces. If the pieces are small and numerous enough that the material can flow, then it becomes a rock avalanche. 8. A debris flow is composed mostly of sand-sized and larger clasts, while a mudflow is composed mostly of sand-sized and smaller clasts. 9. Residents at risk from Mt. Rainier lahars need to know what the warnings mean and roughly how much time they have between receiving a warning and being in actual danger. They need to create a plan to exit their residence quickly, and they need to know which way to go to get to safety as efficiently as possible. 1. The Cryogenian glaciations are called Snowball Earth because it is thought that freezing conditions affected the entire planet and that the oceans were frozen over, even at the equator. 2. The cooling from the end of the Paleocene until the Holocene was related to the formation of mountains including the Himalayas, the Rockies, and the Andes; the opening of the Drake Passage; the development of Antarctic Circumpolar Current; and the closing of the Isthmus of Panama. 3. The first glaciation of the Cenozoic took place in Antarctica during the Oligocene (around 30 Ma). 4. At the height of the last glaciation, the Laurentide Ice Sheet covered almost all of Canada and extended south into the United States as far as Wisconsin. 5. Continental glaciers flow from the areas where the ice is thickest (and therefore at the highest elevation) toward areas (at the margins) where the ice is thinnest. Ice thickness tends to be related to the rate of ice accumulation. 6. The equilibrium line represents the boundary between the area where ice is accumulating (typically at high elevations), and where it is being depleted (mostly by melting). Above the equilibrium line more snow accumulates in winter than can melt in summer so the glacier is always covered in snow. Below the equilibrium line the snow cover is lost by the end of summer. 7. Relatively cool summers are more important because that controls how much snow will melt in the summer. In many situations very cold winters are associated with less snow accumulation than just cold winters. 8. (a) The ice at the bottom of a glacier flows more slowly than that at the top. In fact if the glacier is frozen to its base the lowermost ice might not be moving at all. (b) The edges also flow more slowly than the middle because there is more friction there between the ice and the valley walls. 9. Basal sliding will take place when the bed of the glacier is warm enough for water to be liquid. The water will act as a lubricant to allow the ice to flow. 10. Glaciers carve U-shaped valleys because they are relatively wide (compared with rivers) and most of the erosion takes place at the base rather than the sides. A hanging valley forms where a tributary glacier joins a larger glacier and where the larger glacier has eroded a deeper valley. 11. There must be at least three cirques to form a horn. In most cases there wouldn’t be room for more than four. 12. A drumlin is relatively steep at the up-ice end and streamlined at the down-ice end. A roche moutonée is streamlined at the up-ice end and jagged at the down-ice end where plucking has taken place. 14. Drop stones are large clasts that are present with lacustrine or marine glacial sediments. They form when coarse material drops from melting icebergs. 15. Glaciofluvial sediments (sand or sand and gravel) are likely to be sufficiently permeable to make good aquifers. 1. The size of waves are determined by the wind velocity, the length of time the wind blows in the approximately the same direction, and the area of water over which it blows. 2. Table 17.1 provides data for 56 and 74 km/h winds, and 65 km/h is half way between these two values. The listed values for duration and fetch are high enough for the sea to fully develop, so the simple answer would be that the wave amplitude and wavelength would also be approximately half way between the listed values: amplitude ~6 m, wavelength ~106 m.
3. Waves will start to feel” the bottom at around 50% of the wavelength, so at 50 m depth in this case. This will slow the waves down and also cause their amplitude to increase. 4. A longshore current is the movement of water parallel to the shore in the surface zone caused by waves approaching at an angle. Longshore drift is the movement of sediment parallel to the shoreline, caused partly by the longshore current and also by swash and backwash on the beach. 5. Wave energy is focused on the headland, with more wave energy vectors per length of coast than in the bays, and thus the headland is eroding faster than the bays on either side, leading to coastal straightening. 6. Rocky coasts are eroded by waves and that erosion is greatest within the surface zone. As stacks and arches are eventually eroded away, a wave-cut platform is left. 7. The beach face is the relatively steep area of the beach between the low and high tide levels. This is also known as the foreshore or swash zone. 8. A spit can form where there is longshore drift and the geometry of the shoreline is such that a sand bar extends away from the shore. 9. The area of the Atlantic coast north of Massachusetts (including New Hampshire, Maine, New Brunswick, Nova Scotia, and Newfoundland plus all of the area inland) was glaciated during the Pleistocene and has since rebounded isostatically. This is all now relatively young rocky coast that is being actively eroded. 10. There has been approximately 125 m of eustatic sea-level rise since the last deglaciation, so the current sea level should be approximately 140 – 125 = 15 m lower than it was during glaciation. The dash-dot line marks present-day sea level. An uplifted coast like this should have uplifted wave-cut terraces and coastal waterfalls. 11. Sediments would be trapped in the reservoir behind such a dam, and the water flowing through the dam would be sediment-free. Although there would be erosion of new sediments downstream from the dam, the water reaching the ocean at Richmond would have less sediment than it does now. This is likely to result in the beaches around Vancouver being starved of sediment, and they would gradually get smaller. 1. Most of the sediments on continental shelves originate from clastic sediments derived from erosion on the continents. The shelves on the eastern coast of North America are wider than those along the west coast because there has been relatively recent (Cenozoic) tectonic activity on the west coast, while the east coast has been passive for about 180 million years. 2. Subduction zone trenches may be partly filled in areas where there is significant sediment input from rivers. 3. From bottom to top, oceanic crust is composed of gabbro, sheeted mafic dykes, and pillow basalts. In most areas it is also covered with varying amounts of sea-floor sediments and sedimentary rocks. 4. The oldest sea floor in the Indian Ocean is in the order of 150 Ma. There is oceanic crust of this age along the western margin of Africa, and adjacent to the northwestern part of Australia. 5. Coarse terrigenous sediments accumulate mostly where major rivers enter the sea, but they are only washed a few kilometres out to sea (at most) because there isn’t enough river velocity left to move them farther. Some of those sediments are moved many kilometres farther out to sea during flows of turbidity currents. Clay, on the other hand, can stay in suspension for centuries, and during that time can be dispersed well out into the ocean. 6. Carbonate sediments will accumulate on the sea floor wherever there is significant abundance of carbonate-shelled organisms near to surface, and where the ocean is shallower than the depth at which carbonate becomes soluble (the carbonate compensation depth). In these areas there is typically much more carbonate than clay present, so the sediments look carbonate-rich, even though there is clay there. 7. Carbonate sediments are absent from the deepest parts of the oceans because carbonate minerals are soluble below about 4,000 m depth, so carbonate fragments that settle to that depth dissolve back into the water. 8. The carbon in sea-floor methane hydrates is derived from the bacterial breakdown of organic matter at greater depth in the sediment pile. 9. The tropical parts of the oceans are saltiest because the rate of evaporation is highest. The Mediterranean and Red Seas are saltier than the open ocean. 10. Salty water is transported north by the Gulf Stream and gradually cools. As it cools it remains relatively salty and this cool salty is denser than either cold very fresh water or warm very salty water. 11. The relatively dense water in the north Atlantic sinks to become North Atlantic Deep Water (NADW), and gradually moves back towards the south. 12.The open-ocean currents have the effect of moderating Earth’s surface temperature because warm tropical water is moved toward the poles, and cold polar water is moved toward the tropics. 1. The greenhouse gases (GHG) vibrate at frequencies that are similar to those of infrared (IR) radiation. When IR radiation impinges on a GHG molecule, the molecule’s vibrational energy is enhanced and the radiation energy is converted into heat, which is trapped within the atmosphere. 2. The combustion of fossil fuels releases CO2 that was previously stored in the crust. The resulting increase in atmospheric CO2 leads to a temperature increase. As the temperature increases, the solubility of CO2 in the ocean decreases and additional CO2 is released by the ocean, resulting in even higher atmospheric CO2 levels and higher temperatures. 3. Gondwana was situated over the South Pole for much of the Paleozoic and became glaciated during the Ordovician (Andean-Saharan Glaciation) and again during the Permian (Karoo Glaciation). These glaciations cooled the entire planet during these periods. 4. From a climate perspective, the two important volcanic gases are SO2 and CO2. SO2 is converted to sulphate aerosols which block sunlight and can lead to short-term cooling (years). CO2 can lead to warming, but only in situations where there is an elevated level of volcanism over at least thousands of years. 5. We use 65° for estimating the glaciation potential of orbital variations because glaciers are most likely to form at high latitudes. We use 65° N rather than 65° S because for more than 50 million years the continents have been concentrated in the northern hemisphere. We use July instead of January because for glaciers to grow it’s more important to have cool summers than cold winters. 6. If the major currents in the oceans were to slow down or stop, the tropics would get hotter and the high-latitude areas would get colder, leading to expansion of glaciers and sea ice. The various feedbacks (e.g., higher albedo because of increased ice cover) would result in an overall cooler climate. 7. 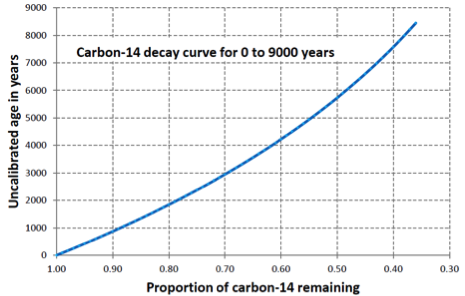 The main climate implication of the melting and breakdown of permafrost is that carbon that was trapped in the frozen ground will be released and then converted to CO2 and CH4, leading to more warming. 8. Sea-floor methane hydrates are stable because the deep ocean water is cold. In order for the hydrates to become unstable, warmth from the upper layers of the ocean has to be transferred to depth. 9. A significant part of our GHG emissions take place during because of the (formerly) intentional and (presently) unavoidable release of natural gas (CH4) during the extraction of oil and gas. Some is lost during transportation — for example when pipelines leak — and some is consumed during transportation — for example to pressurize pipelines or to power tanker trains. GHGs are also leaked to the atmosphere during the routine refuelling and operation of motor vehicles. 10. The rise of sea level results from a combination of melting glaciers and thermal expansion of the ocean water. Both of these large systems are slow to respond to the warming climate. For example it takes a long time for warm surface water to be transferred to depth in the ocean or for heat to be transferred to depth in a glacier. Even if we stabilized the GHG levels in the atmosphere today, the climate would continue to warm for approximately another 100 years, and sea level would continue to rise for much longer than that. 11. West Nile virus is carried by birds and is transmitted to humans by certain species of mosquitoes. The range and abundance of those mosquitoes is partly controlled by climate change, especially by warm winters. Sufficiently warm winters are increasingly common in the northern United States and southern Canada. 2. Nickel deposits form within mafic and ultramafic igneous bodies because the original magma have relatively high nickel levels to begin with, while intermediate or felsic magma have low levels. 3. The “smoke” in a black smoker is composed of tiny crystals of sulphide minerals. If those include significant quantities of ore minerals like chalcopyrite (CuFeS2), sphalerite (ZnS), and galena (PbS), a VMS deposit could form during this process. 5. Ferrous iron (Fe2+) is soluble in water with a low oxidation potential, and gets converted to insoluble ferric iron (Fe3+) when the water becomes oxidized. The opposite situation happens with uranium. Uranyl uranium (U6+) is soluble under oxidizing conditions, but when the water in which it is dissolved encounters reducing conditions the uranium is converted to the insoluble uranous ion (U4+). 6. It is common for the upper part of a kimberlite to be mined using an open pit (in this case around 500 m wide and up to 500 m deep), and for the lower part to be mined underground. 7. Pyrite (FeS2) is typically responsible for acid rock drainage around mine sites, and it is very common for pyrite to form within the rock at the same time that other metal sulphides (e.g., chalcopyrite) are forming. 8. Glaciofluvial gravels are typically relatively well sorted, and may include clasts ranging in size from coarse sand to pebbles. Till, on the other hand, tends to be poorly sorted and may have clasts ranging from clay to boulders. More processing would be needed to separate the required size ranges, and because till tends to be relatively hard and strong, this would require a lot of effort. 9. During the manufacture of CaO limestone is heated and CO2 is released to the atmosphere, adding to the greenhouse effect. The energy required for this process typically comes from fossil fuels (e.g., natural gas) and the combustion also releases CO2. 10. Some important evaporite minerals include halite (NaCl), sylvite (KCl), and gypsum (CaSO4.2H2O). 11. The 15 m of organic matter required to make 1.5 m of coal, is equivalent to 15,000 mm, and if the organic matter accumulates at 1 mm/y that would require 15,000 years. That organic matter would have to remain submerged in oxygen-poor water for at least that length of time. 12. Petroleum source rocks must have a significant component of organic matter, and then need to be buried to at least 2,500 m depth so that the organic matter can be converted to oil or gas. 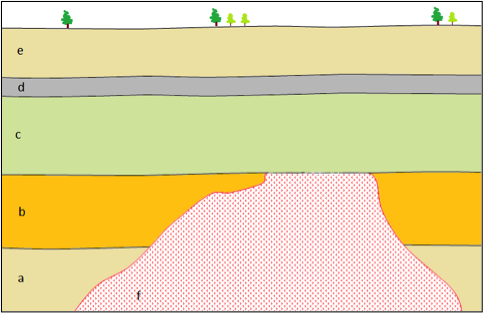 Reservoir rocks must be both porous and permeable, so that the petroleum liquids can be extracted, and should also take the form of a trap (e.g., an anticline) and capped with impermeable rock. 13. The optimum depth for the generation of oil from buried organic matter is 2,500 to 3,500 m.
14. Shale gas is an unconventional reserve because shale is not permeable enough to allow the gas to be extracted. The rock has to be fractured (fracked) to allow recovery. Fracking involves the use of vast amounts of water, and there is the potential that the fracking fluids can contaminate freshwater aquifers. 15. Kimberlite indicator minerals are much more abundant than diamonds within kimberlites, and so they can typically be detected further away from the kimberlite source, and over a much wider area. 1. The oldest parts of Laurentia are the Slave and Superior Provinces. Both have rocks that are in the order of 4 Ga.
2. The regions A through E are A-the Cordilleran Fold Belt, B-the Western Canada Sedimentary Basin, C-the Canadian Shield, D-the Innuitian Fold Belt, and E-the Appalachian Fold Belt. 3. Pearya collided with North America to form the Innuitian fold belt during the Devonian. 4. The ancient sedimentary rocks of the Athabasca and Thelon Basins were deposited on the stable Canadian Shield and were never involved in tectonic processes; nor were they buried deeply enough to be metamorphosed. 5. Ultramafic magma has to be very hot to be liquid, and while Earth’s interior was hot enough during the Archean, it is no longer hot enough. 6. There are several reasons why the preservation is so good in the Burgess Shale: the rock is very fine grained so details are well defined; the dead organisms accumulated in a lifeless anoxic basin so they were not oxidized, scavenged, or broken down by bacteria while they were being fossilized; although some of the surrounding rocks are weakly metamorphosed, the Burgess Shale was protected from squeezing by adjacent strong limestone. 7. The Western Canada Sedimentary Basin was filled with marine water during pre-Prairie Evaporite times and Winnipegosis carbonate was deposited. It slowly dried out to produce the evaporite beds, but was later re-filled, leading to the deposition of Dawson Bay carbonate. The isolation of the basin during Prairie Evaporite times might have been due to a drop in sea level or tectonic uplift. A change to a dryer climate may also have been a factor. 8. The rocks of the Intermontane Superterrane have fossils that are indicative of southern hemisphere deposition, and also have magnetic inclinations that imply an origin south of the equator. 9. Terrane accretion on the west coast led to formation of the Rocky Mountains. The rapid erosion of these mountains provided a source for accumulation of sediments within the WCSB. 10. The western edge of the WCSB was pushed down by the mass of the Rocky Mountains toward the end of the Mesozoic, and thus can be thought of as a foreland basin. 11. The likely order is Yukon-Tanana, Quesnel, Cache Creek, and Stikine, although it is also possible that these terranes were assembled as one unit prior to reaching North America. 12. Nanaimo Group sedimentary rocks were forced inland and up to relatively high elevations on Vancouver Island when the accretion of the Pacific Rim and Crescent Terranes pushed Vancouver Island closer to the mainland. 13. The Paskapoo Formation becomes thinner toward the northeast because the foreland basin gets shallower in that direction, and also because the source of the sediments is the Rocky Mountains, situated along the southeastern edge of the basin. 1. To see an event, light from that event must reach our eyes. Light travels very quickly (about 300,000,000 m/s), but the universe is very, very large. Depending on how far away the event was, it could take billions of years for light to travel from the event to our eyes so we can see it. Astronomers take advantage of this fact to view the universe’s past. 2. B is the spectrum from the Andromeda galaxy. 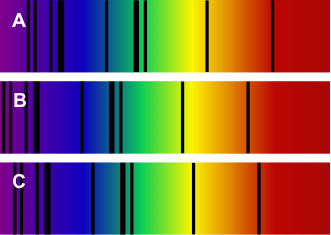 We know that one spectrum represents the Sun, which is not moving toward or away from us. (Our orbit is not perfectly circular, but the small eccentricity is not a factor in this comparison.) We know that the Andromeda galaxy is on a collision course with us, so it is the exception to the rule that galaxies are moving away from us, and their light is red-shifted. That means the spectrum B which is shifted furthest to the left (blue-shifted) is Andromeda, and spectrum A which is furthest to the right (red-shifted) is a galaxy moving away from us. That means C is the Sun. 3. The planetary system consisted of two Jupiter-sized gas giant planets. Gas giant planets contain large amounts of hydrogen, and hydrogen was plentiful in the early universe. In contrast, terrestrial planets have heavier elements, especially silica, iron, magnesium, and nickel, that had yet to be manufactured by stars. Those elements were not present in sufficient abundance to form terrestrial planets until much later. 4. Closest to the sun we find the small, rocky, terrestrial planets with metal cores. Further out are the gas giant planets, which are the largest in the solar system. They consist mostly of hydrogen, and have cores of rock and ice. Beyond the gas giant planets are the ice giant planets, which are next largest. They have a mantle of ice (not just water ice but ammonia and methane ice), and a rocky core. Smaller objects in the solar system include rocky bodies within the asteroid belt between Mars and Jupiter, and bodies of ice and dust in the Kuiper belt and Oort cloud beyond Neptune. 5. The frost line marks the distance from the Sun beyond which temperatures were cool enough to allow ice to form. This helps to explain why the terrestrial planets are closer to the Sun, and the Jovian and ice giant planets farther away. Mineral grains could solidify and begin to accrete closer to the Sun, forming terrestrial planets, because they have higher melting points. In contrast, water vapour, methane, and ammonia had to be farther from the Sun before they could freeze and begin to accrete. 6. The objects are comets, and two places to find large numbers of comets in the solar system are the Oort cloud and the Kuiper belt. The bright dot the comets have noticed is the sun, and the adventurous comet returns displaying the consequences of the Sun’s energy blasting gases and dust from its surface. 7. Planets are defined as having cleared their orbits of debris. Pluto is located within the Kuiper belt, so it shares its orbit with other objects. There are two other criteria in the definition of a planet: planets in our solar system must orbit the Sun, and they must have a spherical shape. Pluto satisfies both these criteria, but sadly the people deciding whether or not Pluto should be a planet are not amenable to a “best two out of three” compromise. 8. Differentiation is the separation of materials within a planet such that dense materials sink to the core, and lighter materials float upward. In Earth’s case, the denser materials are iron and nickel, and the lighter materials are silicate minerals. In order for differentiation to happen, the entire planet must be melted. 9. Thus far it appears that our solar system is unique compared to other planetary systems we have observed. In particular, some other planetary systems have gas giant planets very close to their star. The fact that we have terrestrial planets close to the Sun makes sense in terms of the frost line, but it does not seem to be a hard-and-fast rule in other planetary systems. Therefore, we can’t conclude from Kepler-452b’s position alone that it is a terrestrial planet. 10. The rules to the accretion game mean that there are many complex interactions, so even a small difference in the starting conditions or in how the game goes in the beginning could have major implications in the end. For that reason, we shouldn’t expect to find a planetary system that matches ours in every minute detail. However, just because we haven’t found a similar planetary system does not mean one does not exist. Our planet-finding methods are biased toward discovering large planets orbiting close to their stars, whereas our solar system has small planets close to the Sun and larger ones farther away. That doesn’t mean our methods won’t eventually turn up a system like ours, just that they are more likely to turn up systems that are different. Appendix 2 Answers to Review Questions by Steven Earle is licensed under a Creative Commons Attribution 4.0 International License, except where otherwise noted.